The Queen Elizabeth Tower is more widely known as Big Ben, although this was originally the nick name given to the massive bell of the clock in the tower. Finished in 1853, the Clock Tower, as it was originally known, is one of London’s most iconic images and actually leans slightly to the north-west (about 23cm). 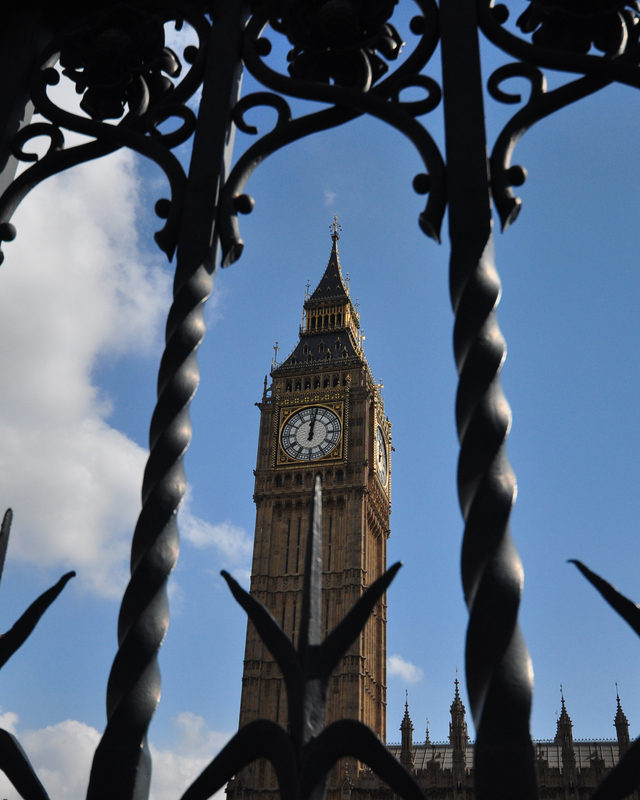 Big Ben behind the railings of the Palace of Westminster. The clock (which is the world’s second largest four faced chiming clock after the one on the Minneapolis City Hall), is famed for its precision and accuracy but it hasn’t always looked as it does today. For two years during the First and then again in the Second World War, its face was darkened (and the bell silenced) to prevent attack by Germany, and during the Blitz part of the roof and two of the faces were damaged. When these were repaired, an additional five floor block was added. The chimes of the clock are as famous to those in the UK as the clock tower itself, with television stations around the country sounding in midnight on New Year’s eve – but don’t get it wrong the first chime signals the hour, not the last. Times Square has its ball and London its Bell. Although it’s not possible for most people to access the tower, UK residents can arrange to join a tour of the inside. This is done by contacting your local MP or Peer of the Realm if you happen to have one on speed dial. If you are lucky enough to fit the bill, then plan ahead and get fit, as the tours tend to fill up 6 months in advance and includes climbing all 334 spiraling stone steps to the top.